Many corporates in the UK are struggling to manage cash liquidity as debt finance becomes unattainable in this shifting macroeconomic environment. So, what does a company to do to make sure they’re getting the best return, and truly making the most out of their current cash balance? Even with the unavoidable financial instability, there are certainly things that can be done to earn substantial returns on cash, with many corporate treasurers looking for new approaches in their financial strategy. And that’s where CMP comes in. Investing in a Cash Management Platform (CMP) can be a financially rewarding decision, and it can be tailored to match your existing treasury requirements. It’s possible to use a CMP either as a stand-alone strategic treasury solution, in conjunction with your existing Treasury Management System (TMS), or with your current Enterprise Resource Planning (ERP) software. Differing from the core value proposition of a TMS (find out more here), CMP is designed to help you make your cash work harder. Any company with a positive end-of-day balance can simply utilise the power of a CMP by sweeping funds cross-bank and potentially even cross-country, to make the most out of a higher bank interest rates – Oh and it works perfectly when it comes to managing forex volatility. Therefore, a CMP can make your cash work harder with just a few clicks of a button. If as a treasurer your objectives are to manage cash, manage risk and maximise return on your existing cash balances, so that sufficient funds are available to meet group obligations, then a CMP could be a wise investment. A CMP has been designed to help large corporations optimise cash, and manage funds with minimal risks, all the while maintaining full cash visibility across their entire banking estate. And what’s more, a CMP is available wherever you are in the world, and whenever you need it. With TMS providers just beginning to move their solutions to the cloud, it’s no surprise that CMP comes cloud ready – After all the leading developers in CMP arena are FinTech companies. Is a CMP right for your business? Is your business interested in optimising its cash even when you’re not at work? Through a CMP you can make sure that you’re getting the best return on your business bank balance, which can assist in placating the effects of financial fluctuations and prepare additional funding in case of an unforeseen business crisis. Sweeping savings tactically to higher interest rate bank accounts can help treasurers optimise their organisations cash position. If, as a company, you’ve got a surplus of cash sitting dormant in an account, and you want to make the most out of preferential interest rates, then utilising the power of a CMP is your next logical step. It’s no longer about doing more with less; it’s about getting the most from what you already have. So, do I still need my TMS? When treasurers ask us this question, we always say to them that it really is up to you and how your organisation manages its finance and treasury function. Every organisation has its own individual business processes in place. 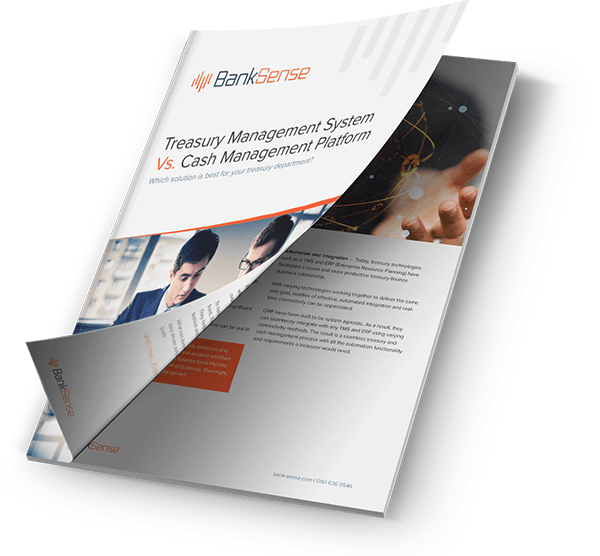 Some treasury departments have a standalone TMS or an ERP, some have both. And others rely on the age-old spreadsheet methodology – Can you believe in this day and age, this is still happening. CMP have been designed and developed to work independently or in conjunction with any other existing treasury software. As a result, if you have an existing TMS and an ERP, CMP will integrate with both solutions and will enhance your treasury function even further. All you have to remember is that, CMP is primarily there to make your cash work harder, and to make your cash go further.